The little Elves of Darkness, so says the old Iroquois Grandmother, were wise and mysterious. They dwelt under the Earth, where were deep forests and broad plains. There they kept captive all the evil things that wished to injure human beings,—the venomous snakes, the wicked spiders, and the fearful monsters. Sometimes one of these evil creatures escaped and rushed upward to the bright, pure air, and spread its poisonous breath over the Upper World. But such happenings were rare, for the Elves of Darkness were faithful and strong, and did not willingly allow the wicked beasts and reptiles to harm human beings and the growing things. When the night was lighted by the Moon's soft rays, and the woods of the Upper World were sweet with the odour of the Spring flowers, then the Elves of Darkness left the Under World, and creeping from their holes, held a festival in the woods. And under many a tree where the blades of grass had refused to grow, the Little People danced until rings of green sprang up under their feet. And to the festival came the Elves of Light,—among them the Tree-Elves, Flower-Elves, and Fruit-Elves. They too danced and made merry. But when the moonlight faded away, and day began to break, then the Elves of Darkness scampered back to their holes, and returned once more to the Under World, while the Elves of Light began their daily tasks. For in the Springtime these Little People of Light hid in sheltered places. They listened to the complaints of the seeds that lay covered in the ground, and they whispered to the Earth until the seeds burst their pods and sent their shoots up to the light. Then the little Elves wandered through the woods bidding all growing things look up to the Sun. The Tree-Elves tended the trees, unfolding their leaves, and feeding their roots with sap from the Earth. The Flower-Elves unwrapped the baby buds, and tinted the petals of the opening flowers, and played with the Butterflies and Bees. But the busiest of all were the Fruit-Elves. Their greatest care in the Spring was the Strawberry Plant. When the ground softened from the frost, the Fruit-Elves loosened the soil around each Strawberry root, that its shoots might push through to the light. They shaped the plant's leaves, and turned its blossoms toward the warm rays of the Sun. They trained its runners, and helped the timid fruit to form. They painted the luscious berry, and bade it ripen. And when the first Strawberries blushed on the vines, these guardian Elves protected them from the evil insects that had escaped from the world of darkness underground. 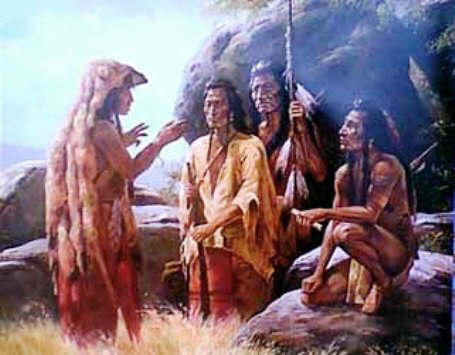 The old Iroquois Grandmother tells how once, when the fruit first came to earth, the Evil One, Hahgwehdaetgah, stole the Strawberry Plant, and carried it to his gloomy cave, where he hid it away. And there it lay until a tiny sunbeam pierced the damp mould, and finding the little vine, carried it back to its sunny fields. And ever since then the Strawberry Plant has lived and thrived in the fields and woods. But the Fruit-Elves, fearing lest the Evil One should one day steal the vine again, watch day and night over their favourite. And when the Strawberries ripen, the Elves give the juicy, fragrant fruit to the Iroquois children as they gather the Spring flowers in the woods.